It was wonderful to have such great weather for once for the event. Pat Travers Band is scheduled to play Bikefest 2017! Bikefest will be back for the fourth year in a row. Taking place over the long Columbus Day weekend, this promises to be bigger and better than the first three! Come enjoy free concerts on Town Hill, vendors, bikini competition, bike shows and more in the picturesque setting of Colonial Beach - Virginia's "Potomac River Playground"
All American Harley-Davidson were one of the main sponsors. They along with Ripley formerly from 97.7 The Rocket radio station had discussed the idea in 2013 while dining at High Tides Restaurant, and I'm so glad they did! I can't wait for this event to return! 4 - 8:00 pm: DJ C.J. at Sage Restaurant 119 Hawthorn St.
12:00 - Veterans Appreciation Ride arrives in Colonial Beach. Sponsored by the American Legion Riders Post 148. OPEN TO ALL RIDERS. Registration is from 8:30-9:30 am at the Museum in Quantico. The American Legion Riders will lead the caravan. All the other riders will follow and the Veterans' bus from Quantico will bring up the rear. Kick stands up at 10:00 am. 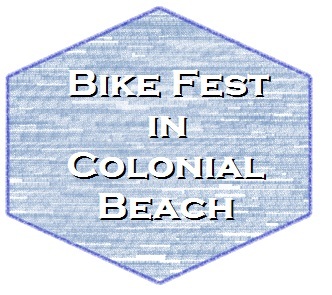 12:00 - 1:00: Lunch at The American Legion, 27 Colonial Ave.
1:00 pm - Bike Fest Kickoff on the Main Stage. American Legion Honor Guard will be present. Dignitaries welcome Veterans. Prayer for the Veterans and the Bike Fest. 5:30 pm - Dinner at the Moose Lodge, 4780 James Monroe Hwy. 8:30 pm - Snakebite at the Eagles, 517 Colonial Ave.
8:00 am - Charity Poker Run Fundraiser for Natalie at Monroe Bay Campground. Kickstands up at 9:30. Stops at Uncle Dave's, Wilkerson's and Dockside. $25 per bike, $10 per passenger. All bikes in by 2:00 pm where there will be FREE beer, BBQ, water and sodas (donations appreciated). There will be a raffle for a 65" 4K Smart TV, 50/50 raffle, auction as well as a corn hole tournament. There will also be a live band starting at 6:15 pm. Call 540-446-1404 for info. 10:00 am - Registration opens for Bike & Rider Motorcycle and Golf Cart Show hosted by Boston Nichols at Dockside. 10:00 am - Full Armor (Adam Hirsch and Mark Euker) at High Tides. 12:00 pm - Hard to Tell on the Main Stage. 1:00 - D.J. Kirk McEwen from WIYY 98 Rock on the Main Stage. 540 Stunt Boyz in the Colonial Plaza shopping center parking lot. Lord of the Beards facial hair competition at Dockside. 4:00 - 8 pm: Stars N Bars karaoke at Sage Restaurant 119 Hawthorn St.
5:30 pm - BBQ Dinner at the Moose Lodge, 4780 James Monroe Hwy. 7:30 pm - Cinema on the Green "Easy Rider" 717 Marshall Ave.
9:00 - 5:00 pm: Bike Show at the American Legion, 27 Colonial Ave.
4:00 - 7 pm: Hard to Tell at Sage Restaurant 119 Hawthorn St.